This new inspection device from Medit inc. offers an ultimate viewing experience since it is compact, highly maneuverable and most importantly has outstanding tip articulation, providing better inspections. Medit Inc., one of the biggest North American online suppliers of innovative NDT solutions, is pleased to introduce a new addition to their STRAHL line of professional high-performance equipment – RIGEL Articulating Video Borescope. The new articulating borescope from Medit, Inc. is a unique product among affordable middle class devices as it features ultimate angulation due to a patented technology, which gives users access to objects, areas, and structures that are extremely difficult to reach. Rigel Video Borescope is equipped with a sensitive, high-resolution CMOS video camera chip (up to 450 000 pixels on 5.5mm probe and 100 000 pixels on 4mm probe). It allows to capture even the tiniest defects and transport the images to the integrated 3.5” color digital LCD with 720x640 resolution. The probes come in different lengths, 1m (3.3’), 2m (6.5’), or 3 m (9.8’), and diameters. 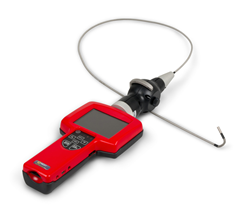 The RIGEL Video Borescope is also available with Ø4mm probes that are widely used for aircraft and helicopter maintenance and inspection of areas with extremely narrow openings. All probes are interchangeable and can be replaced within seconds. The extra durable stainless steel-braided probe neck is designed to withstand many cycles of articulation and contributes to the device’s exceptional maneuverability. Recently a lock has been incorporated on the probe’s body, allowing to stabilize the camera in the desired position, which greatly increases image clarity and overall quality. All inspection findings can be saved as snapshots or videos to an SD memory card that can be easily inserted or retrieved from the memory card “open” slot. RIGEL Video Borescope is also equipped with USB interface (1.1/2.0) and AV output jack to transfer inspection data to computers or larger TV monitors. All camera’s operation, for example, adjusting LED illumination intensity level, tip articulation, image capture and other, is controlled by means of intuitive buttons located on the compact control unit. Now RIGEL is equipped with a rubber anti-slip handle to make Inspection process even more convenient for operators. The articulating video borescope operates on a powerful rechargeable LI-polymer battery, allowing for up to 4 hours of uninterrupted video capture at full intensity. The new compact handheld camera is an innovative versatile tool that not only offers operators comfortable, free of wires, working conditions, but also provides high-quality inspection images of hard-to-reach areas unexpected from a device of such small size and price range.